Moving Targets, my three-year research project and culminating art installation with Steffi Domike has come to a close, at least for now. 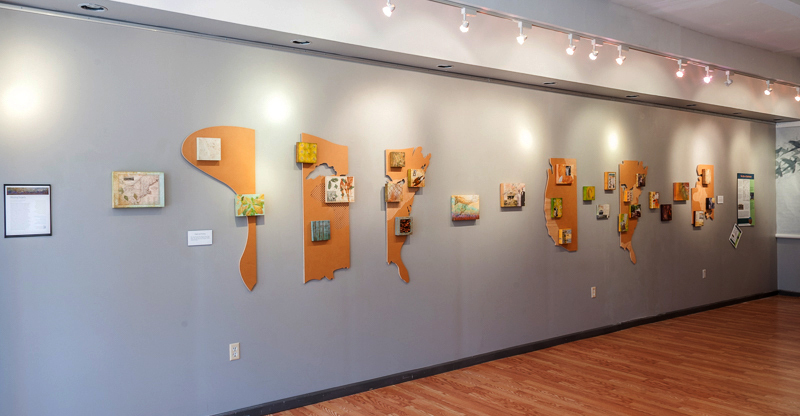 Our fifth showing of the project at Christine Frechard Gallery in Pittsburgh (above) was a big success. See a short video that provides an overview, and see the Moving Targets section of this web site for more info. 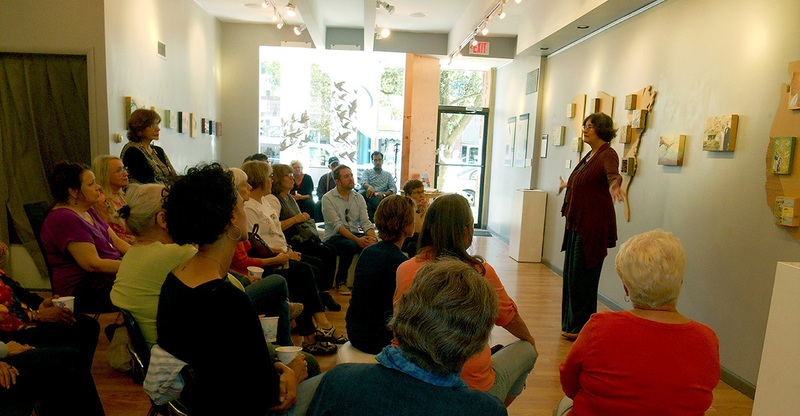 We had a full house for both our gallery reception and artist talk. For the latter, we were joined by Dr. Ruth Fauman-Fichman (our project researcher and a catalog essayist) and Dr. Patricia DeMarco (another catalog contributor, shown above). You can read Ms. DeMarco’s catalog essay here. We were well received by the Jewish community, which was our aim in showing the work and announcing our catalog in Squirrel Hill, a predominantly Jewish neighborhood in Pittsburgh. Many were interested in our family stories and shared their own. We sold several catalogs during the run of the exhibition, which includes six essays by distinguished social and natural scientists and artists. The catalog details all aspects of the exhibition, providing vignettes for each artwork (sample page above). It also highlights passenger pigeon centenary events produced by Project Passenger Pigeon Pittsburgh, of which we were a part. 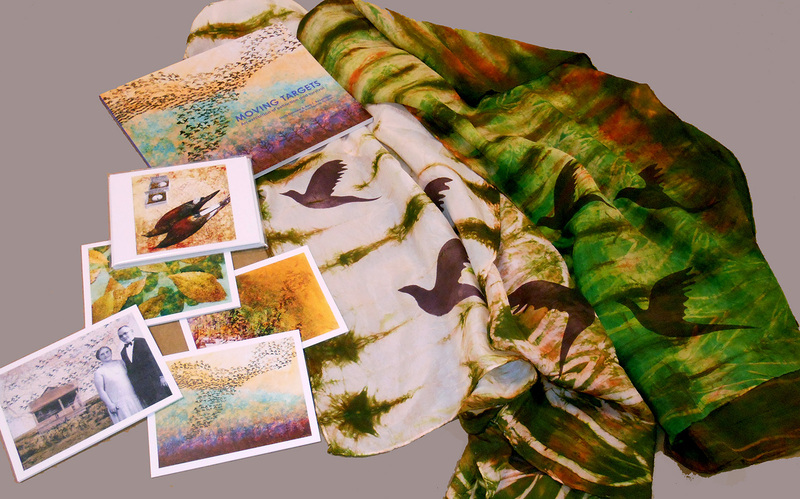 Following the closing of the exhibition, we are getting out the “perks” (above) we promised our many wonderful contributors, including a set of six note cards, each with a unique reproduction of an artwork ($25 level); hand-dyed and printed silk scarves ($50 level), and catalogs ($100 level). We are continuing to accept contributions directly to cover our costs for the project (post a comment below if you would like to contribute and we will contact you). Contributors will receive the perks listed here. You can also buy the catalog directly here. Note that the cost of the catalog covers the production; we are not making any extra on these sales! We are very pleased with the outcome of our three-year effort and are already thinking of future projects that will explore similar themes. We thank all our contributors, colleagues, friends, and family who donated money, time, skills, and support for the project. It has been a grand journey!